The Gang of Five is back in this third story from Paintbrush Falls. Addie Carle, the only girl in the group of friends is outspoken, opinionated, and sometimes…just a bit obnoxious. But as seventh grade progresses, Addie’s not so sure anymore about who she is. It seems her tough exterior is just a little too tough and that doesn’t help her deal with the turmoil she feels on the inside as she faces the pains of growing up. Told in elegant, accessible verse, ADDIE ON THE INSIDE gives readers a look at a strong, smart, and sensitive girl struggling with the box society wants to put her in. Addie confronts experiences many readers will relate to: the loss of a beloved pet, first heartbreak, teasing…but also, friendship, love, and a growing confidence in one’s self. I loved the way this was written in chunks in verse. This is one of those books every teacher needs to have on their shelves. The book is a great look at middle school life and how students bully each other without thinking they are bullying. 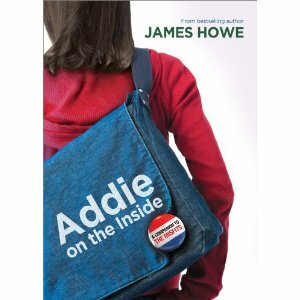 It is a great look at how words hurt and how one student, Addie, copes with it. I loved Addie’s character. She starts off sounding as if she has a shell built around her and doesn’t care what others think about her. Slowly the layers are peeled away so that we can see her true heart. This should be mandatory reading for all students. This entry was posted in July 2011, Magical realistic fiction, Young Adult. Bookmark the permalink.